On December 23rd, 2012 we met Becca. Over the past six and a half years she’s been featured in well over 300 videos and photo stories, not to mention the countless photos scattered throughout the FWR site and the numerous unreleased videos that you’ll soon enjoy. Due to her amazing acting abilities she has raised the bar of fantasy female wrestling and boxing to a level that few have been able to meet (although we’re proud to have several actresses who are very close to that bar). While your humble FWR producer would love for all the FWR Superstars to stay with him forever, he knows that lives change. Becca has moved to a nearby state but is still a short flight away and plans to visit us at least once a month or so to continue creating her amazing style of videos. So … it’s NOT the end of the Becca era, it’s the beginning of a new chapter in Becca’s life. One that will still include bringing your custom scripts to life but also one that will limit her FWR availability. I’m proud of my little Becca, a young woman who I’ve come to think of as a daughter I never had. I’m proud of her choices in life and I’m proud that she cherishes FWR enough that she plans to continue her reign as the champion actress at FWR. We will make announcements here in the notices area whenever Becca will be visiting. Custom orders will obviously be limited but we’ll do our best to fulfill as many as we can on each of her visits. Pick the girls YOU want, write YOUR own script, and bring YOUR fantasy to life! Female Wrestling, Female Boxing, and More! This site was inspired by my love of women's wrestling. From the early 70's, when I realized that females were involved in the predominantly male sport of professional wrestling, I wanted to be a part of it. Being a fan, I bought every pro wrestling magazine that I could find that included women. I subscribed to catalogues from companies that sold "apartment wrestling" videos. I watched televised pro wrestling events diligently waiting for the rare female wrestling match. And then came... THE INTERNET!!! 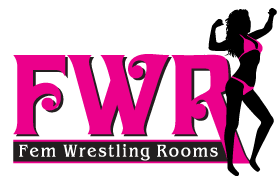 With patience, hard work, many talented models, and a knowledge built from being a fan, Fem Wrestling Rooms was born! Please take some time to look around, check out our videos and photo stories, and consider becoming a special VIP member. There's something for nearly everyone's tastes and I'm sure you won't be disappointed!